This started out as a Facebook post and was becoming a VERY long! I decided to post it here in this neglected space instead. In case you didn’t know, today is my 31st birthday! Before 8 am I was already blown away by the kindness of the people God has placed in my life. My super awesome Fairy Garden birthday party is taking place on Saturday. I think birthdays should always fall on weekends! Weekday birthdays when you aren’t celebrating until the after, or before even, confuse you on how to feel about your real birthday! Okay, maybe it doesn’t confuse you, but it confuses me! Some people don’t like or care about birthdays. I however love them! So it’s always an emotional struggle when my birthday celebration isn’t on my birthday. I’m incapable of not caring about either day, real birthday or postponed birthday. Selfish right?? I believe in transparency so I’m all about sharing the ugly sides with you too. And this sinful selfishness is admittedly an ugly side. So all that to say, I have some birthday thoughts/reflections already this morning. It’s been a great day already and most of that greatness happened before 8 am. I was convinced it wouldn’t be a good day, but now I’m convinced it will continue to be. I’ll likely share a play by play via social media all day, but first, I really want to be cheesy and attribute this birthday happiness to someone else. I know myself REALLY well! I know my triggers and patterns. I’ve been praying since Sunday that I wouldn’t be a jerk on my birthday. I know I’m sinfully selfish. I know I love birthdays. I knew spending the day at a new job with people who don’t know me yet or that it’s my birthday had the potential to make me feel lonely and therefore sour. I also knew that postponing birthday celebrations until Saturday meant my actual birthday might not feel special. I also knew if I was a jerk to my friends for not making me feel special (see?? narcissistic, sinful, selfish, being real here! ), I’d feel like an even bigger jerk come birthday party day when they would be so kind and supportive and celebratory. I was prepared for a foul day. How silly! As I was driving to work praying after spending not nearly as much time as I would have liked to spend with Jesus, the song I’m currently obsessed with, “You Make Me Brave” by Bethel Music, came on as it does every morning so far on my drive. 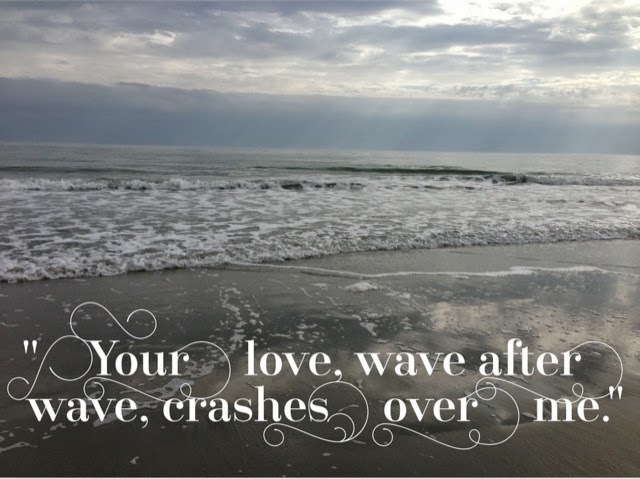 I always am moved by the lyric, “You call me out beyond the shore into the waves.” But today I was moved to tears by the lyric, “Your love wave after wave, crashes over me. For you are for us, you are not against us.” As I was already overwhelmed with the love of the friends He’s given me crashing over me, I was even more overwhelmed with His love! As selfish as I am, and as minor as something like a birthday is, of course He didn’t want me to have a bad birthday! One of the most meaningful things I learned while at seminary was brought to mind. It wasn’t from a lecture or a book, it was from a simple short devotion a professor delivered to our class. He talked about Jesus’ first miracle of turning water into wine at the wedding banquet. Of all the miracles He did, a fairly simple one in comparison. But our professor made the very memorable point that it mattered to Mary, so it mattered to Jesus. She cared about that banquet. As a good hostess, she was stressed out about running out of wine to serve her guests (my inner hostess totally understands)! And because it mattered to Mary, it mattered to Jesus. The little things we care about, matter to Him too! I poured my heart out in genuine prayer, not asking for a good day, but just asking that I wouldn’t be a sinful selfish jerk to my friends, and He answered! Bring your little things to Him too, He really does care. Hey Kasia! Happy belated birthday! Thanks for the reminder that Jesus cares about the little things. He wants us to come to him with everything. That's what having a relationship with Him is about. I've never heard of the song, “You Make Me Brave” I'll have to check it out! Kasia- I so enjoy your openness and vulnerability in this post. It is very hard, sometimes, to share our real selves (even the ugly sinful parts) in our blog posts, but I have learned that it is so important. Thank you for that. And I hope you had an awesome birthday. I look forward to learning more about you through the Becoming a Better Writer Community Group. Highly recommend! It's a great album!